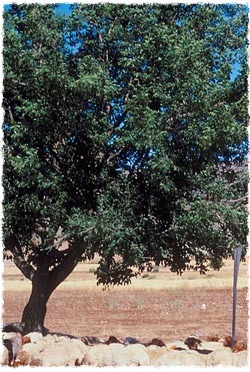 The 15th of Shevat is the New Year for Trees, known as Tu b’Shevat. It was therefore of vital importance to ascertain when the new year started for produce. Our Rabbis established that a fruit which blossomed before the 15th of Shevat is produce of the previous year. If it blossomed afterwards, it is produce of the “new year.” [By comparison, grains, vegetables, and legumes have the same New Year as humans, the 1st of Tishrei.] Why is this so? In the Mediterranean region, the rainy season begins with the festival of Sukkot. It takes approximately four months (from Sukkot, the 15th of Tishrei, until the 15th of Shevat) for the rains of the new year to saturate the soil and trees, and produce fruit. All fruit which blossom beforehand are a product of the rains of the previous year, and are tithed together with the crops of the previous year. Although this day is Rosh Hashanah for trees, we attach special significance to this holiday because “Man is [compared to] the tree of the field” (Deuteronomy 20:19). Through cultivating strong roots – faith and commitment to G?d – we produce many fruits—Torahand Mitzvot. Due to the festive nature of the day, we omit the Tachanun sections (petitions for forgiveness and confession) from the prayers. Rabbi Silberberg resides in Brooklyn, New York, with his wife, Chaya Mushka, and their three children. The content on this page is provided by AskMoses.com and is copyrighted by the author, publisher, and/or AskMoses.com. You are welcome to distribute it further, provided you do not revise any part of it and you include this statement, credit the author and/or publisher, and include a link to www.AskMoses.com.